Likely the first printed map of Manhattan's Upper West Side. 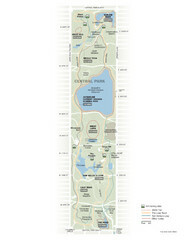 Map is titled 'The West End Plateau of New York'. From martayanlan.com: "A finely produced street plan by Egbert L. Viele and his son Herman to promote the Upper West Side of New York as the most appropriate area at the time for luxury real estate development. Included is a pamphlet that describes the area and argues that investment in, and the building of beautiful, opulent homes on Upper West Side are not merely a good ideas financially, but also a civic duty and an act of good public spirit. 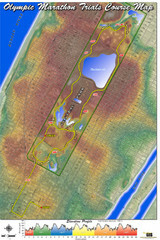 Central Park appears along the eastern edge of the map following the Olmstead plan, a small irony in that the elder Viele had been an early competitor of Olmstead in designing the park. Manhattan Square, adjacent to Central park, would later become the grounds for the Museum of Natural History. The future grounds of Columbia University are also depicted, but Viele neglects to mention that its buildings are those of the Bloomingdale Lunatic Asylum, which would remain in place until 1894."